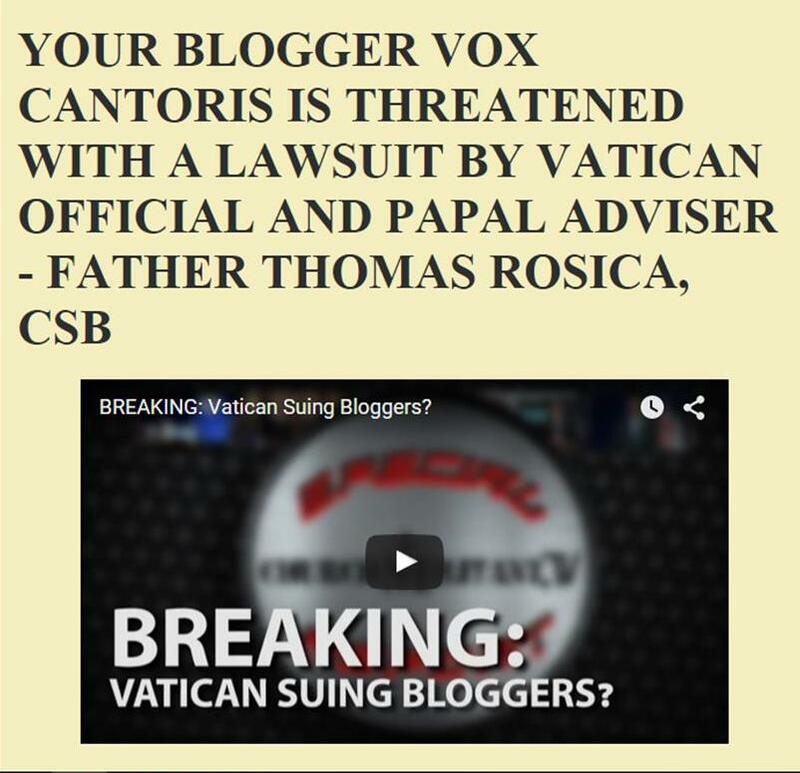 Vox Cantoris: We are being punished. Vatican II IS the problem. Do not lose your Faith! We are being punished. Vatican II IS the problem. Do not lose your Faith! "If Francis were to die tomorrow, and were to be replaced by a “safe V II” Pope, what would be the consequence? What would a hypothetical JP III do that would prevent, one day, the election of a Francis II? Nothing, absolutely nothing! We would have more V II rubbish; which, in time, would unavoidably lead to the appointment of a faithless, lewd old man like Francis. A new, “moderate” V II Pope would mean more World Youth Day, more Assisi gatherings, more ecumenism, more pacifism, more search for easy popularity, more Korans thankfully accepted as gift, more pope concerts and mega-masses, more watering down of truth, more of all we have seen from John XXIII until 2013. The slippery slope that begins with a John XXIII must perforce end with a Francis, or worse. No, I don't think the Lord will save us from the worst. It seems to me that this is not God's plan. It seems to me that the savage arrogance of V II must now be paid in full. It seems to me, in other words, that the absolutely lunatic times the Evil Clown is preparing for us are allowed by God to show us the utter lunacy of the rebellion of V II. Unless we are made to eat all the excrements that Francis and, very probably, his successors will dish us we will never understand the monstrosity of Vatican II in the first place." Cardinal Sarah may be cut from a different cloth and able to restore tradition. It remains only that he will be elected. Let us pray. And the fruits of the desire of thy soul are departed from thee, and all fat and goodly things are perished from thee, and they shall find them no more at all. The merchants of these things, who were made rich, shall stand afar off from her, for fear of her torments, weeping and mourning. And saying: Alas! alas! that great city, which was clothed with fine linen, and purple, and scarlet, and was gilt with gold, and precious stones, and pearls. For in one hour are so great riches come to nought; and every shipmaster, and all that sail into the lake, and mariners, and as many as work in the sea, stood afar off. And cried, seeing the place of her burning, saying: What city is like to this great city? And they cast dust upon their heads, and cried, weeping and mourning, saying: Alas! alas! that great city, wherein all were made rich, that had ships at sea, by reason of her prices: for in one hour she is made desolate. Rejoice over her, thou heaven, and ye holy apostles and prophets; for God hath judged your judgment on her. Mundabor nails it as usual. Kyrie eleison. Traditional Catholics have always known that VII has been the cause of the downfall of the CC, but let's remember that they had nothing to do with it. It was brought about & then forced down our throats by this Marxist/Masonic/Modernist ideology promulgated by the Popes & Hierarchies since John XXIII. Even the Popes prior to that time knew this was coming but failed to stop it - Satan was too strong. We could rightly ask why God gave Satan a hundred years to bring down the CC in the first place? The Old Rite is in every Catholic's DNA & if VII could be rescinded (which we have always stated it should be) there would be no problem in restoring it. To get to that point however means removing the constraints, again in our DNA, of honouring the Papal Office & following the Pope of the day & his Hierarchy. Blind obedience is holding us back, not only in the laity but also in the clergy, and this defect will have to be resolved at some future date. Satan knows this to be our achilles heel - what started out as necessary discipline has become the bugbear of our present state. It must be overcome, as these heretics are not worthy of obedience of any kind. It goes against Divine Law to say they do & that is the only reason they continue to hold the Seat of Peter. Christ Our Kind MUST be fully reinstated on His Throne in the persona of a valid & licit Pope who by his demeanour & stalworth upholding of the True Faith is given the honour of leading Christ's faithful back home. The reaction to VII will come, it is inevitable. The further we move away from the Council, the less important it seems. The more those devoted to the Council go to their eternal reward, the less opposition traditionalists will face in the Church. Once the secular world begins to persecute the Church more actively, the myth of dialogue and reconciliation with the modern world will evaporate (e.g. if the State were to force the Church to recognise "gay marriage", it would be all over). The collapse of American power in particular will signal the start of the collapse of VII in the Church, because VII is the Americanisation of the Church (http://www.papalencyclicals.net/Leo13/l13teste.htm). This goes for the collapse of the EU too, the EU being a CIA manufactured American outpost. Changes in political circumstances will cause a change in the Church, because VII is nothing but the Church prostrate to the modern liberal political arrangement, a kind of surrender to Caesar almost. The American republic is the greatest of post-Enlightenment liberal states, and with its decline, the Spirit of VII will begin to evaporate. Vote Trump indeed, insofar as he is against American Imperialism.